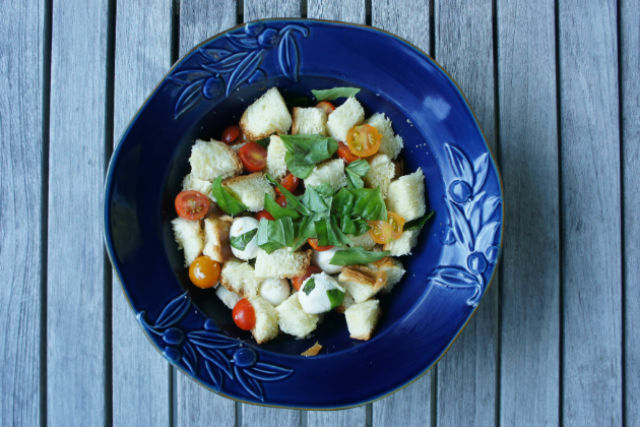 Panzanella salad is about as classic summer (and Italian) as it gets. Day-old, crusty bread takes on a new, fresher life when paired with juicy summer tomatoes, veggies and a light dressing. There are so many variations of this beloved salad, but to me they all scream one simple thing: summer. Also resourcefulness. Also delicious. Ok, this salad screams three things to me. Many people scoff at the idea of leftover challah bread, but really, it happens to the best of us. Of course you can make bread crumbs, French toast and even Thanksgiving stuffing with leftover challah, but this salad is another great way to use what you already have and make it into something new and delicious. I recommend using challah that has been sitting for a few days. If challah seems on the softer side, toast it briefly in an oven heated at 300 degrees in a single layer on a baking sheet for 10 -15 minutes, until golden. You can also toast in a pan on the stovetop in a small amount of butter, oil and garlic if desired. Preheat oven to 300 degrees. Spread out challah cubes in single layer. Dress lightly with olive oil if desired. Bake until just toasted and golden, around 10-15 minutes. Remove from oven and allow to cool. Add toasted challah to large bowl. Toss with tomatoes, red onion and fresh basil. Whisk together ingredients for salad. Add salt and pepper to taste. Toss salad with dressing. Serve immediately.